Kombucha has long been a player in the wellness world, dating back to Chinese culture in 200 BCE. For those unfamiliar, it's a beverage that generally begins with green or black tea which is then fermented with a symbiotic culture of bacteria and yeast (also referred to as SCOBY). The name is said to be derived from Dr. Kombu, a Korean physician who presented the drink to Emperor Ingyō of Japan to help cure his ailments. (Back then it was much more savory and made with mushrooms—not the sweet commercial variations we drink today.) As a testament to its large concentration of B vitamins, Japanese samurai warriors allegedly carried the tea in their wineskins to energize them for battle. Fast-forward to several centuries later, and kombucha's popularity skyrocketed worldwide, with figureheads even claiming it had the ability to address serious diseases like AIDS and cancer. Of course, such claims have not been proven. Despite the validity of these large assertions, there are several chemical compounds found in kombucha that make the case for it being a nutritious, "functional" beverage. These are all dependent on the individual fermentation times of the brews, the temperature at which they're manufactured, and their sugar content, among other factors, but generally speaking, you'll likely find several B vitamins, detoxifying glucuronic acid, and antioxidant-rich polyphenols, all adding to the allure of the beverage. 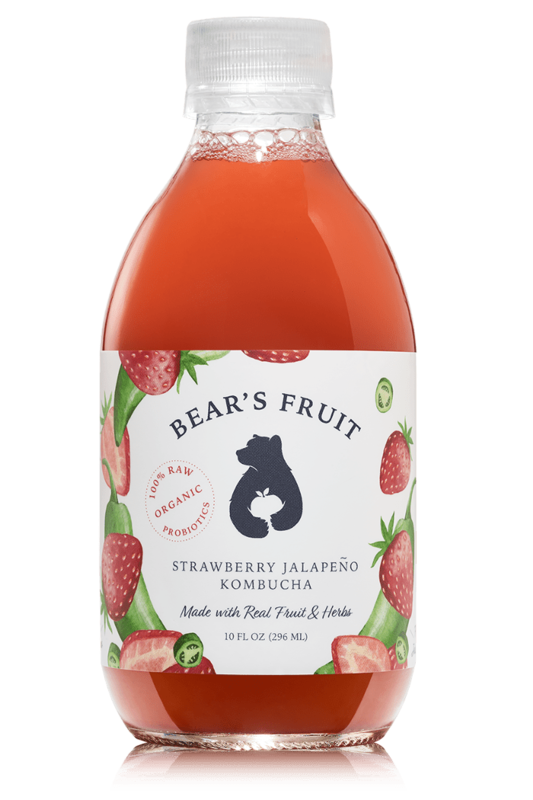 We recently visited the HQ of Bear's Fruit, a Brooklyn-based kombucha company, where co-founder Amy Driscoll chatted with us about the benefits of this popular carbonated beverage. Driscoll poured through stacks of research (though truth be told, more studies need to be done) and put together 10 scientifically backed benefits of kombucha to validate its thousands of years of existence. Her words, below. "As we age, our skin cells deteriorate, causing the skin to lose its elasticity, sag, and wrinkle. Kombucha tea contains powerful antioxidants called EGCGs which are 20 times better at attacking the free radicals that break down your cells than vitamin C, which studies have shown is associated with better skin and notable decreases in skin wrinkling." "As mentioned before, kombucha contains EGCGs as well as theaflavin, two powerful antioxidants that help our body defend against dangerous free radicals, which have been linked to cancer and other chronic diseases that account for a major portion of deaths today. For instance, one randomized controlled study on heart disease found that drinking black tea for 12 weeks significantly decreased triglyceride values by 36%, reduced blood sugar levels by 18%, and lowered the LDL/HDL plasma ratio by 17%. "Kombucha has three times more vitamin C than an orange (151 milligrams per 100 milliliters of kombucha compared with an orange's 51.1 milligrams)." "Kombucha has a ton of B vitamins (B1, B2, B6, and B12, to be specific), which are essential for maintaining and producing new, healthy cells. Drinking this 'vitamin B cocktail' found in kombucha helps your skin glow and strengthens your hair and nails." "Kombucha tea has been proven to have natural antimicrobial properties thanks to the fermentation process. The good bacteria (probiotics) and acetic acids in kombucha help your body kill the bad bacteria we’re exposed to on a daily basis. "Kombucha inhibits the growth and spread of dangerous and toxic microorganisms such as salmonella, E. coli, and listeria. "Beyond the potential pitfalls of foodborne illness from questionable takeout, the pH level in kombucha can also kill strep throat and other icky germs you pick up while riding the subway to work." "Probiotics reduce the number of calories you absorb from food and affect hormones and proteins related to appetite, fat storage, and obesity by upping your healthy gut bacteria count. "Acetic acid has been proven to curb hunger, reduce bloating, and reduce overall body weight by preventing your body from processing food into fat." "The healthy gut bacteria found in kombucha improves digestion and prevents oh-so-fun bathroom issues like diarrhea. "One important note here: Kombucha is a naturally carbonated beverage. Too much carbonation can actually reverse the anti-bloating benefits you get from the probiotics, making you feel gassier and generally meh. How much is too much? If opening a kombucha bottle is similar to popping a bottle of champagne, then that’s too much (even if it is more fun, sorry!). Bear’s Fruit is only lightly carbonated for a crisp taste without the unpleasant side effects." "The glucuronic acid in kombucha binds to toxins, which allows the kidneys and liver to push them out faster. Toxins can be anything from one too many tequilas (we’ve all been there) or harmful carcinogens and pollution we’re exposed to on a daily basis. In fact, studies have shown drinking kombucha regularly reduces liver toxicity caused by dangerous chemicals by 70% in some cases." "Kombucha contains vitamin B9 (also known as folic acid), which has been known to help with memory recall and fight against neurodegenerative conditions in the brain including Alzheimer’s disease, stroke, and epileptic seizures." "Is #MeatlessMonday your thing every day of the week? You may want to pick up some Bear’s Fruit to avoid vitamin B12 deficiency, which has been linked to anemia and fatigue. Vitamin B12 is found almost exclusively in red meat and other animal products but is key for physiological maintenance including red blood cell production and aiding with memory and learning. The good news is kombucha naturally contains approximately 100 times the amount of vitamin B12 found in lamb." Next, here's what happens to your body when you start drinking matcha.